Play with strength and weights. With this massive pulley you can lift with little force a lot of wei..
A challenge for little climbing artists! 4 strong ropes with 5 wooden bars (4 x 68 cm) invite to tra..
Fun is coming in motion – a great swing, with braided ropes fixed to a metal ring. Strong and soft i.. 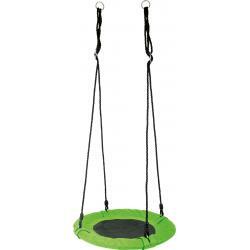 Fantastic swinging fun is provided by this great item of sturdy, fine polished wood on a durable syn..
Children feel great on this net swing! The heavy duty seating surface is secured with adjustable rop..
With adjustable ropes and mounting rigs. High side parts for a secure seat. Max. load 30 kg. Lengt.. The movement of this swing made of fine polished solid wood offers great fun for toddlers! The durab.. This tyre reaches top speed swinging into the sky! The tyre swing made of robust, weather-proof mate..